On the 23rd there was a short suspension of hostilities to enable our forces to remove the dead that lay in the more exposed places. While this was in progress the opposing armies had a chance to rise up out of the earth and engage in a social chat. 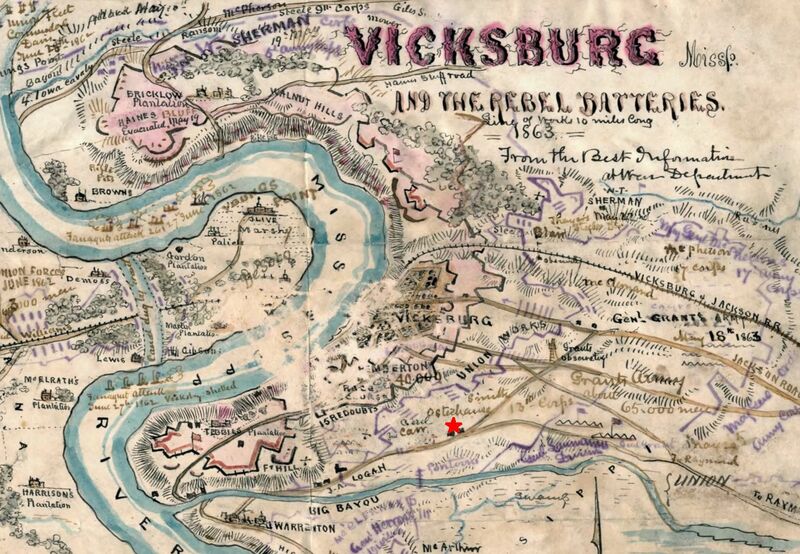 The artillerymen in our front were Mississippians. They were dressed in good grey uniforms and were a little saucy. The infantry were Texans, dressed in butternut--belonging to Wayl's (Waul's) Legion--had been organized at camp Groce, near Tyler, Texas. A more illiterate set of men and boys were never brought together. They asked curious questions of the 'Wah.' Wanted some of our coffee but had nothing to 'swap' for it, as "grub" was short. Intellectually there was a contrast noticeable between them and their comrades the artillery boys, though every man was a good soldier and a dead shot. When the truce ended the opposing armies vanished behind their defences and the ugly work was resumed. The friends of a few minutes ago suddenly again became man hunters. Men from the western wilds and Kentucky mountains mingling with comrades from the denser populated districts, scattered among the ditches and "gopher holes," and with the eagerness of hungry panthers watched for a victim wherever a gun-barrel glistened or an object moved above the hostile works. It should be noted that conflicting information exists as to which day the truce, mentioned by Wolbach, above, actually occurred. Other reports indicate that Gen. Grant was too proud to request a truce the day after the second assault and, after more than two days in the hot sun, the odor coming from the battlefield was so great that Confederate Gen. John C. Pemberton submitted a flag of truce and his soldiers hastily buried the Union dead while also finding several still alive. * Information and italicized quotations above from a series of articles entitled Camp and Field - The Old 16th Ohio, written in the 1880s by Theodore Wolbach, late Corporal in Company E, 16th Ohio Volunteer Infantry. 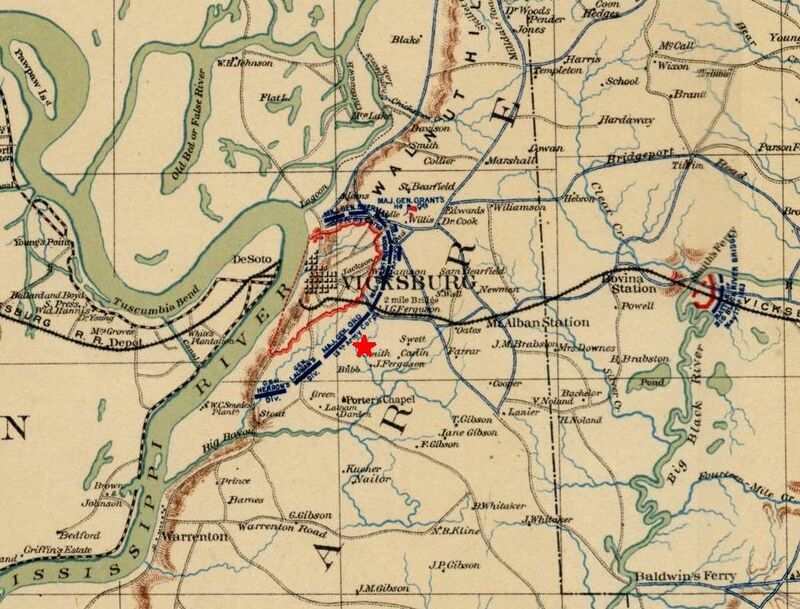 The siege began on the 23d. Batteries were pushed forward to favorable points, within close range of the enemy's line, and protected by heavy earthworks thrown up by night; trenches and covered ways were cut connecting the batteries with ravines. The extraordinary ruggedness of the ground, which had been such an obstruction to the assault, now proved of great advantage to the besiegers. In front of nearly every division was a natural covered approach, through some define, to within three or four hundred yards of the enemy's line--in some cases these distances were less than one hundred yards.